Wandering in Gràcia: Discover Barcelona Beyond the Gothic Quarter and Sagrada Familia. When we prepare for a visit to Barcelona, we are mostly advised to go and see the Gothic Quarter, church of the Sagrada Familia, and the many other creations of the genius mind of Gaudi. We might want to walk the famous La Rambla Street and buy fruits at the Market of La Boqueria. Those tourists’ magnets are absolute musts to see and well worth our time – they are famous for a reason! But I would advise you to go and see the district of Gràcia, to wander around its narrow streets and get lost among bohemian cafés and tiny shops. 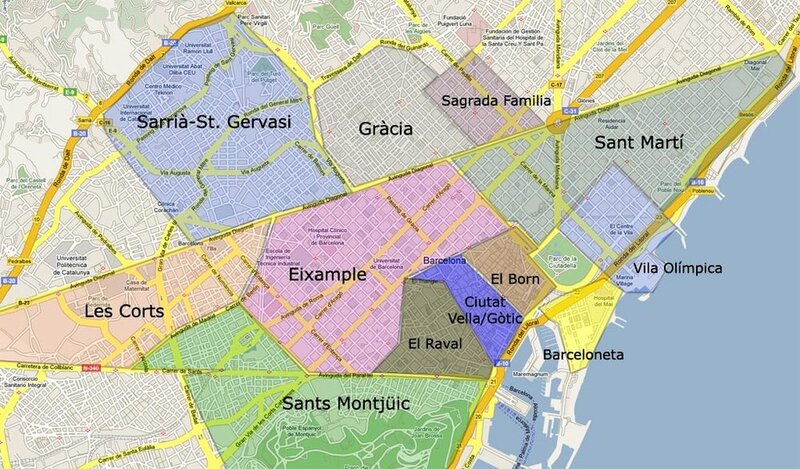 Today Gràcia is a district of Barcelona, but until late 19th century, it was an independent municipality. Its history reaches the early 17th century, when a group of the Carmelites established a convent there, named "Nostra Senyora de Gràcia (Our Lady of Grace)". Just look at the lovely balconies! Growing population of Barcelona during the 19th century required spreading the city and soon the new district of Eixample reached Gràcia. But even though it was officially annexed, it remained its distinct character and atmosphere to this very day. Although Gràcia does not have many tourist attractions, it is well worth your time to walk her narrow streets. You probably won’t find here any big brand stores or expensive high-end shops and it might be the wrong quarter for any fast-food fan. But if you love independent artsy stores, tiny mom-and-pop shops, authentic tapas bars and local cuisine serving restaurants – you are in the right place. Organic veggies or tattoo studios, local designer clothes and quirky souvenir points, unique cafés and outside bars gathering locals and visitors are the heart of this quarter. Gràcia knows how to party! Gràcia’s most famous event is the Festa Major – a week-long street party happening in August, that I sadly haven’t had the chance to see yet. But I was lucky to be there during the last weekend of carnival when I felt awkward by being one of the very few not dressed up people! People of all ages and ethnicity populating Gràcia prepare for this weekend for quite a while. In smaller groups – like dance schools, people from the same building or store – they create their own costumes and participate in a parade. You could almost taste the joyous atmosphere. If that night was any indication of how the people of Gràcia can party together – I can’t wait for my opportunity to come over during the Festa Major! I am in love with Gràcia's balconies! When I walked the streets of Gràcia I was particularly charmed by the obvious care people put in their surroundings. Balconies were decorated with plants, sometimes pictures or other decoration. I also saw many Catalan flags showing the strong will for independence among Gràcia’s inhabitants. There is also the famous Park Gruell on the outskirts of Gràcia. Created by Antonio Gaudi, it is a wonderful place to walk around and have stunning views over the city. I chose not to go to the paid part, but wandered around the free section – there is plenty to see, too! But if I can give you a piece of advice: don’t go on a sunny weekend day – the place was packed with people and it was February! I can’t even imagine how crowded the Park is in high season. If you want to visit the sculpture park with famous Gaudi’s houses – make sure you book the tickets in advance, as there is a limited number of them sold a day. There were a lot of musicians and all kind of opportunists trying to get the tourists' money. Some of them played beautifully - like this gentleman above, some were seriously obnoxious and loud. I found the park really beautiful – not just thanks to Gaudi’s architectural pieces but to the very well-chosen greenery, matching perfectly the Mediterranean climate and creating opulent gardens. Just look at the photos and imagine yourself walking those narrow streets, sunny squares, resting in one of the many outdoor cafés, buying fruit from the local vendor or admiring hand work from an artist. And best yet – don’t just imagine, but go and wander yourself! Have you been wandering in Gràcia, Barcelona? Did you like it? Let me know in the comments below! The Big Drama of Winter in Chania, Crete.